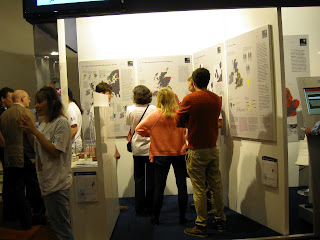 I had the opportunity yesterday to attend the Royal Society’s Summer Science Exhibition. My main interest in attending was to find out more about the People of the British Isles Project, who had been invited to take a stand at the exhibition to present their work. The exhibition was packed out all day and there seemed to be a constant crowd of people around the People of the British Isles exhibit as can be seen from the photos below. I did manage to have a brief chat with some of the scientists who are working on the project, including Bruce Winney and Simon Leslie, to find out what progress has been made since June when I attended the Ancient Britons conference in Cardiff where the genetic map of Britain was presented for the first time. The People of the British Isles Project has now taken DNA samples from 4,371 volunteers. To participate in the project volunteers must live in a rural area and all four of their grandparents must have been born in the same county. The DNA of 2,031 of the volunteers has now been sampled extensively using modern chip-based sequencing technology, which is the same methodology used for the 23andMe test and Family Tree DNA's Family Finder test. The People of the British Project has looked at 600,000 different markers known as SNPs (single-nucleotide polymorphisms) for their analysis. Although the chip contains both Y-chromosome (Y-DNA) SNPs and mtDNA (mitochondrial DNA) SNPs, they have so far only analysed the autosomal SNPs. Autosomal DNA is shuffled up and recombined with each new generation and provides a picture of the genetic make up of all our ancestors, whereas Y-DNA and mtDNA only tell us about our direct paternal and maternal lines respectively. The researchers analysed the DNA using a technique known as linkage disequilibrium. They are essentially looking for motifs or patterns within the DNA which are specific to whole populations or sub-populations. The DNA data was analysed using a computer program called Fine Structure, which places the results in clusters based on their genetic similarity. This process requires an astonishing amount of computer power and it apparently took a week to run all the UK samples through the program. Once the clustering had been completed, the researchers added the geographical data to the samples and plotted the co-ordinates on a map using an average derived from the birth place of each individual's four grandparents. 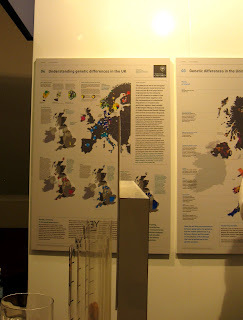 The resultant genetic map of the British population that was on display at the exhibition can be seen on the Royal Society's website. The colours shown on the map represent distinct genetic clusters. This was essentially the same map that we saw at the Ancient Britons conference. It can be seen that certain parts of the British Isles, such as Devon and Cornwall, are genetically quite distinct, whereas others, such as the whole of the south-east of England, are a homogenous mass. In some places distinctions have even been found within regions. In Orkney, for example, the people of Westray were distinct from those on the Mainland. There is a particularly large cluster in Anglesey but this is apparently because samples were taken at an agricultural fair on the island and the researchers were inundated with people wishing to take part in the project! 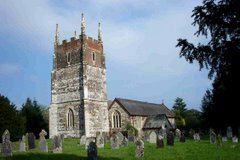 The researchers have compared the results of the British samples with a collection of European samples. They have access to genetic data from 6,300 people in Europe. The samples were taken from projects such as the International Multiple Sclerosis Genetics Consortium and other data which is included in the Wellcome Trust Case Control Consortium 2. These samples were originally collected for medical studies and the researchers do not know the place of birth of the four grandparents or have any other ancestral information from the participants. However, they do know the name of the hospital or centre where the samples were taken which has enabled them to provide some geographical context. It was found, perhaps not surprisingly, that people in the south-west of England in particular were genetically quite similar to the people of north-western France. In the north people showed greater similarity with Scandinavian populations. I was understandably not allowed to photograph the European maps in close-up but a view of the display is shown below where you can just about distinguish the different-coloured clusters in Europe. A paper will be submitted for publication in the next month, probably to Nature. 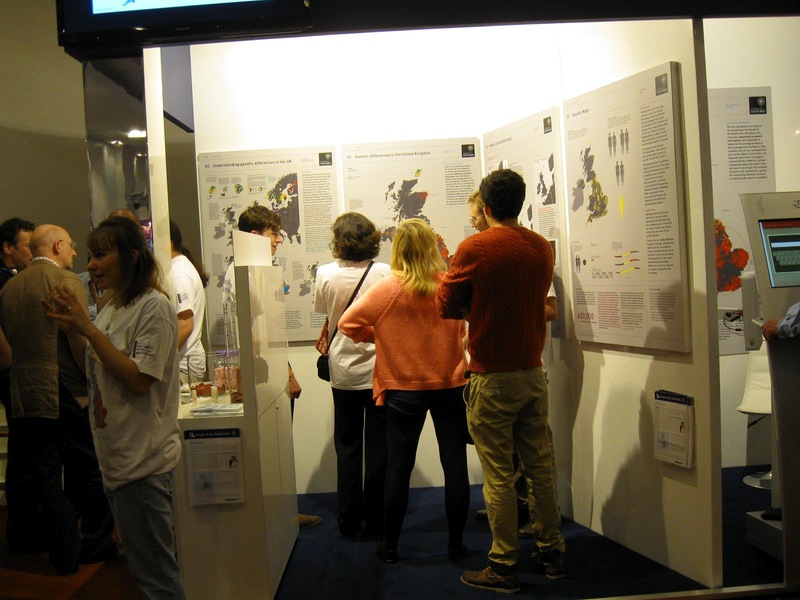 All the maps on display at the exhibition will be included in the paper, and additional maps will also be included showing the different levels of clustering analysis. Some of the genomes from the project (some from Cornwall and for one other county) have apparently been uploaded to the 1000 Genomes Project. The raw data from the project will not be published with the forthcoming paper but will eventually be submitted to the Wellcome Trust Case Control Consortium. Researchers wishing to use the data will have to submit an application to be granted access. The data will be made available to population geneticists and not just medical researchers. Although Y-DNA and mtDNA SNPs are included on the chip used by the project, the researchers have not yet started analysing these data. I was told that Professor Mark Jobling at the University of Leicester will probably be doing the Y-DNA analysis. A D.Phil. is also due to join the project in the autumn to help with this work. The project is also hoping to do some ancient DNA analysis as a comparison, but nothing has as yet been planned. The project still has two more years to run, and there will no doubt be other interesting papers published in the next few years. Nice post, Debbie. You could almost believe we planned to report the Event this way! We seem to have both covered different aspects. You also got some pictures that I missed.